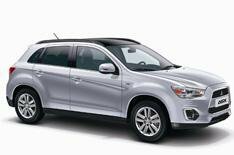 2012 Mitsubishi ASX revealed | What Car? The 2012 Mitsubishi ASX made its European debut at the Paris motor today. The face-lifted ASX is Mitsubishi's rival to compact SUVs such as the Nissan Qashqai and Volkswagen Tiguan; it gets styling tweaks and a more efficient diesel engine. Cosmetic tweaks include a softer, less angular grille and a new rear bumper. The interior gets new fabrics, along with chrome trim on the front doors. A rotary knob that used to control the car's four-wheel-drive system has been replaced with new push-button switchgear. Mitsubishi has also revised the ASX's rear suspension to give sharper handling and a more comfortable ride. The existing engine range a 1.6-litre petrol and 1.8-litre diesel will be joined by a 114bhp 1.8-litre diesel. This engine has CO2 emissions of 125g/km 11g/km lower than the existing diesel. The 2012 Mitsubishi ASX will go on sale in Europe later in the autumn. Prices are yet to be confirmed.